Everyone’s favourite band (well, mine at least) has deserved success for decades, yet the recognition that they have received has always been a good deal less than their talent and sales (third in consecutive gold platinum albums after The Beatles and The Rolling Stones!). Why is that, this film seeks to ask as it looks at a potted history of the band from high school to present day. It’s a charming documentary that probably contains little that the rabid fan isn’t already aware of, but is nice to have anyways, a celebratory overview akin to that of the recent Anvil! The Story Of Anvil. Unlike that film, however, there’s a much more detached feel – the band, Neil especially, are treated with kid gloves, there’s little of their modern everyday lives revealed, and of course the relative state of their careers is completely different. They are similar, however, in the way that each could be an introduction to the band – numerous talking heads are employed here, from Jack Black to Kirk Hammett, to praise Rush to the skies, their musicianship, their status, even what nice human beings they are. Where this approach slightly falters is in the far greater detail given to the start of the band’s career, the likes of Rush and Fly By Night not generally recommended as the best place to start in their discography as good as they are. Make no mistake, it’s certainly interesting – the footage of first drummer John Rutsey especially, as well as the family archival footage of a grumpy teenage Alex Živojinović discussing leaving school with his family. One section, of the band playing a school dance, is especially brilliant – of course, even then they were a fantastic group more than capable of getting a crowd grooving. Since then, the film seems to say, they’ve only gotten better, a group insistent on challenging itself above and beyond the usual challenges that every band faces over the course of their career. For example, although I’ve since come to love the likes of Hold Your Fire and Power Windows, they’re not universally popular (I hated them at first, and talking head Mike Portnoy is bluntly dismissive!) and the band’s defence of their embrace of fast-aging technology is interesting, as much as Alex’s upfront complaints at his feeling of being sidelined. Even a clip of the infamous Time Stand Still music video is shown, the band flying around in very dated style! 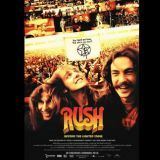 Although throughout the film focuses on the music rather than the band members, it does make time for Neil Peart’s personal tragedies and their impact on the other members, and his subsequent period of travel. I’ve read Peart’s book about it, Ghost Rider, and even there he refuses to fully unburden, to share his grief, talking rather blandly about the places he goes and making it an unusual travel journal of sorts, emotionally disconnected from the rest of us due to that looming tragedy which stays in your mind as you read and colours the experience. He’s an interesting writer, sharing little of himself openly but making you very aware of his thoughts and general outlook in subtle ways – parts seemed almost cold, but it’s a reflection of the man himself and his complex attitude towards fame. The film mentions his shyness and inability to connect with fans in the same easy, light-hearted way that Geddy and Alex can. In any case, you can tell that he seems healed now from his interview sections, and now he even has parts in the band’s comic live interlude videos! That sense of humour is always present with the band. One lovely moment where Geddy and Alex are being interviewed in a restaurant sees a woman recognising Geddy with eagerness and completely blanking Alex, leaning over him dismissively as he laughs in mock outrage. It’s on the extras that comprise the second DVD that we get a better glimpse of the band as human beings all in all. Geddy and Alex are driven through discuss their childhood neighbourhood area, talking about everything from the bullying they got on their way home from school, to their first gig in a Church basement, all fascinating – not least because they get lost and can’t remember which Church it was! Other discussions about Hemispheres with memories from Les Claypool, Roll The Bones’ rap section, and the band’s various fashion disasters are all great, and I defy any fan not to enjoy even the discussions of their on-tour hobbies (Alex – golf, Geddy –baseball, Neil – biking). I loved the Rush conventions, with the hilariously bad karaoke and obsessed fans that you recognise yourself in. Elsewhere, whether it’s the warm-up or various live clips from history to present, there’s more than enough to enthral – Best I Can and a great eight-minute Working Man from 1974 with Rutsey, La Villa Strangiato from 1979, Between The Sun And Moon in 2002, let alone modern clips of Far Cry, YYZ and Entre Nous. My favourite, however, is a very silly twelve-minute segment where the band sit and have dinner together and just laugh and joke together, showing off their solid friendship. As a whole, this will be of interest to newcomers but is more than vital for fans. We’re all aware of much of what it contains, but rarely have it packaged in this superb style. You could argue that it does little for the knowledgeable fan, and ask whether Rush is the sort of band that has merely ‘casual’ fans – yet it’s nice to have, and over three hours’ worth of Rushage is never to be sniffed at. It was only when I reached this point in the review that I realised Sam Dunn and Scott McFayden of Metal: A Headbanger's Journey and Iron Maiden: Flight 666 fame were behind this too. They seem to fast be becoming one of our wonderful genre’s best documenters, and Beyond The Lighted Stage is easily up there with their other works as a must-view.